I should preface this post by saying that it is not necessary to have your child in nearly as many activities as I do. In fact, I don't even think that you have to spend money (or a lot of money) in order to provide them with the same benefits and opportunities. If you do your research, you will be able to find a plethora of articles on the importance of downtime and the negative impacts that over-scheduling can have on a child. Of course, you can also find articles that argue the contrary – in favour of the benefits of activities for children. From my perspective, it is about finding a balance that aligns with your family’s needs and what will make you and your children the happiest. Personally, I like the structure, routine, and predictability of activities that enable my kids to get out of the house and interact with others. My two are very social and they crave time with their peers. 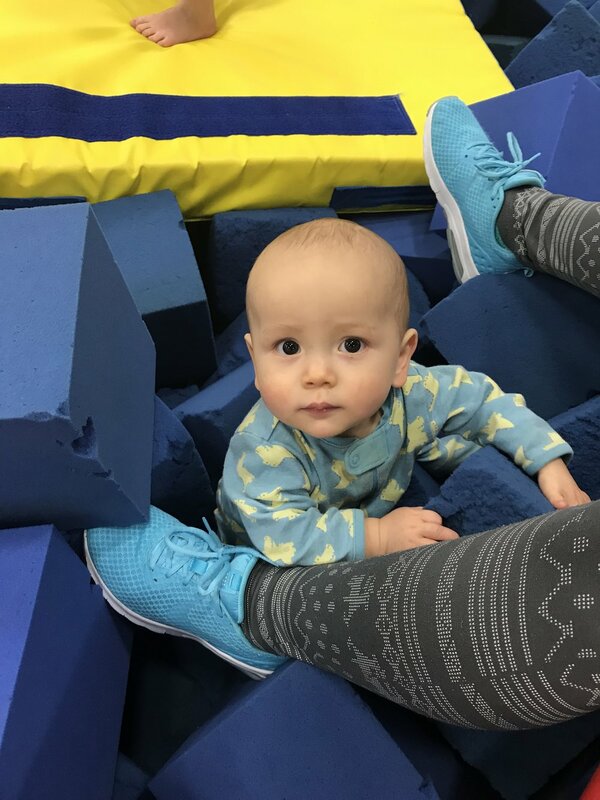 Of course, we have built-in daily quiet time, free play, and open art as well, and these pursuits nourish their souls and aid in their development as much as any external activity would. We aren’t blessed to have family living nearby to provide some much-needed socialization or a break from the monotony that is everyday life. And, of course, living in Calgary means long, cold winters; therefore, having a scheduled destination forces us out of the house when we would rather curl up in a ball and hibernate under the covers. Unfortunately, simply waiting for the Spring melt isn’t an option! While I like routine and knowing how my day will be structured, I understand that this could make others feel overwhelmed and therefore such rigidity isn't necessary for all. What works for you is by far the best option. Quite often, however, I am asked by other parents “why are your kids in so many activities?” – read on for the real answer. Do I believe my children will be future gold medal gymnasts? World-renowned artists? Sought after architects or designers? The next Lionel Messi or Alex Morgan? A future prima-ballerina? A professional skater, skier or swimmer? Absolutely not. Obviously, never say never, but that is without a doubt the least of my concerns as I count down the minutes until online registration opens for a fast-filling class beginning next month. The reason why my kids are in so many activities reaches far beyond the very obvious skills that an activity may provide, such as fine motor development in art class, body awareness in ballet class, or hand-eye coordination in a sports class. Don’t get me wrong – all of these skills are a fantastic bonus that should be practiced, but they are also skills that I can teach my kids at home. At such a young age, however, alongside these fundamental skills, the goal of these activities is to provide my kids with an opportunity to socialize with other people (children and adults alike) in a variety of settings. Through play and socialization, children learn a diverse range of skills that become the basis for future growth. Engaging with peers helps kids meet other developmental milestones. Through these activities, they learn boundaries, rules, and social norms that become the foundation for higher-level interactions. In addition, in order to prepare our children to be successful adults, we must allow them the opportunity to fail, so that they can correct their behaviour and learn from their mistakes. The end goal being to promote healthy and positive relationships. The simple act of playing with other kids, whether at a free drop-in library class, at the playground, or in the form of sports, allows them to hone their sharing, turn-taking, problem-solving, and boundary setting skills. Early development of these skills drives their ability to better empathize – to understand the feelings of others and move beyond simply tolerating, but also accepting a range of diverse and unique individuals. Essentially, their egocentric thoughts begin to turn outward as they learn how to reflect on the feelings of others. As a stay-at-home mom whose husband works out of town and has no regular help from family or a nanny, the primary role of rule-enforcement and discipline is mine alone. My children understand the rules and boundaries I have created. They understand my expectations, follow my rules, and accept the consequences when they choose to not do so. By putting my children in activities, they become adept at not only following my direction but the direction of others in positions of influence. They learn to adapt to another person’s directions and understand the importance of respecting others and listening in a variety of circumstances. I want my kids to be able to take criticism from others and turn it into a positive learning experience. I want them to know they will always have things to work on, and taking the advice of others is a sign of strength, not weakness. Activities help develop a growth mindset; the idea that continued work and motivation will lead to greater achievements. I want my children to be on teams and to recognize the benefits of working together to achieve a common goal. I hope my kids will be able to understand what showing up for teammates really means and to recognize that every player – not just the star – contributes to team success. I want my children to learn sportsmanship, determination, and resilience through both success and failure. I want my children to win, but I also want them to lose. They need to know that inevitably, there will be setbacks and there will be failures, but how they choose to bounce back from these moments will ultimately determine where they end up. Most importantly, I want my children to find a passion for something. Something that sparks their interest and ignites their spirit to the very core. Maelle and Linden are enrolled in activities outside of mine or my husband’s interests. Activities that are wide ranging and cover a gamut of skill sets. Telling our kids to love a single sport or enterprise closes the door to so many possibilities currently open to them. Not to mention, forcing a child to partake in something they don’t actually enjoy will only create a distaste for that activity, and possibly, participation in other activities as well. When my kids are in middle/high school, and the possibility of a negative experience within the confines of school (e.g., bullying) becomes a reality, I want them to have somewhere else to go. Something to turn to where they can feel joy and acceptance no matter what. Whether their interest lies in art, science, or physical activity – and regardless of if they perform at a high level or just for fun – having a place to go where you feel a sense of belonging can make the burdens of adolescence seem a lot easier to tackle. Therefore, when someone asks me why my kids are in so many activities and I respond with “because they enjoy it", that is just the tip of the iceberg. I can see the benefits my children have reaped every time a class is completed. I see beyond the here and now and understand that all the interactions and acquired skills are leading to them being better humans in the future. I hope that these activities provide them with a set of competencies so vast (that I, or my husband, alone could never teach) that it makes them better friends, colleagues, and partners. I have watched them gain confidence and friends, and if years from now they find a single passion that brings them happiness, then every dollar, every drop-off, every pick-up, and every minute spent waiting on this damn computer for the registration to open will be worth it a million times over.